LONDON — A train in which seats are deflated in the rush hour to make more room for passengers has been designed for Network Rail as a solution for overcrowding on busy commuter lines, the Daily Mail reported. The futuristic carriage has been likened to a ‘bouncy castle’ by the designers, who say it will have 40% more space for people than on current trains, the report said. The interior floor, walls, ceiling, windows and seats are formed from a continuous ‘cloud skin,’ which houses all the functions required in a train interior, including seating, lighting and variable-temperature air-conditioning. The ‘air train’ could be a reality by 2020, according to Arup, the design and engineering consultancy behind the project, according to the Daily Mail. 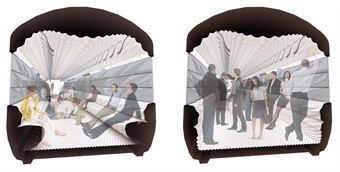 Arup collaborated with Nikken Sekkei on a feasibility study of an alternative approach to commuter train interiors as part of the RIBA ‘Tomorrow’s Train Design Today’ competition, which fosters innovation in train rolling stock design.